For those of you who may not know, motorbike is the main form of transportation in Indonesia. Especially Bali, since the island is quite small. There are many brands of bikes sold here and some of them are popular brands just like the cars we have back home, such as Honda, Suzuki and Yamaha. There's also a brand called Kymco, made in Taiwan. Kymco is known for it's "scooter" style models. Kymco hasn't come out with a new model in 3 or 4 years...until now. 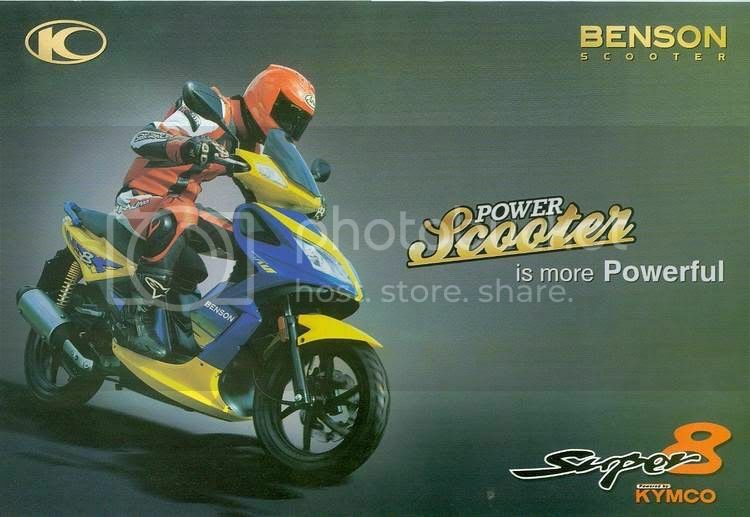 Kymco recently introduced two new models under the brand Benson: "Like", which is a scooter model, and "Super 8", which is a sport model. The Like has a 150cc engine, luggage compartment, handphone charger, comes in your choice of white, silver or red and is priced around 24 million rupiah ($2,500). The Super 8 has a 150cc engine, comes in your choice of red, combination of blue/yellow or combination of green/white and is priced around 22 million rupiah ($2,700 ). This is quite expensive for a motorbike here, as other models have new bikes for around 13 million rupiah ($1,500). Information taken from HERE. Click on photos to be taken to their source. After Kymco released their new models, then Honda introduced their new scooter, "Scoopy". It has a 110cc engine and is priced around 13 million rupiah ($1,500). Information and pictures taken from HERE. Though, I must warn you, the website has a really, really annoying ad that scrolls down the page with you as you go and I couldn't close the darn thing no matter how many times I tried! They are both super cute. I would love to have either one of them. What are your thoughts? Would you drive one?